Our simple supply agreement makes getting started easy! 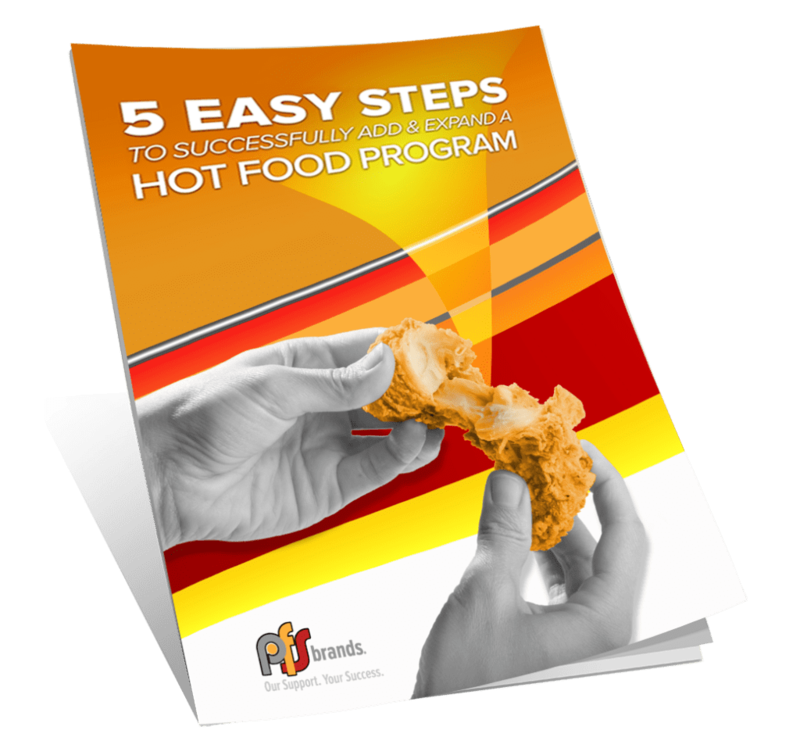 Wondering which hot food program is best for you? Our guide helps you evaluate which is best for your grocery store, and how to add or expand a program in 5 easy steps. 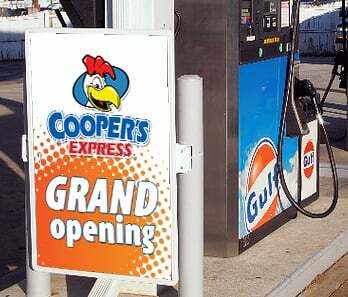 “What makes Cooper’s Express such a win for retailers is not only the brand’s appealing taste, but also its very low cost of entry,” says Shawn Burcham, CEO of PFSbrands. Cooper’s Express stores enjoy the ever expanding levels of support the company provides its retail partners… all aimed at empowering the success of hot food programs. With hundreds of locations across the US, Cooper’s Express simple supply agreement makes it easy to get started. Cooper’s Express kicked-up flavor profile will blow your customers away and keep them coming back again and gain for more! We aren’t like some of our competitors that sell you a program and leave. We have multiple layers of support to help you along the way. Worried about the staff training required for a foodservice program? We have you covered with opening and ongoing staff training! We set aside funds from your PFSbrands purchases for marketing! Combine that with our expert team and it’s a winning combo. We help customers find your location with our store locator. Plus, we work with several directors to get your location listed and found! 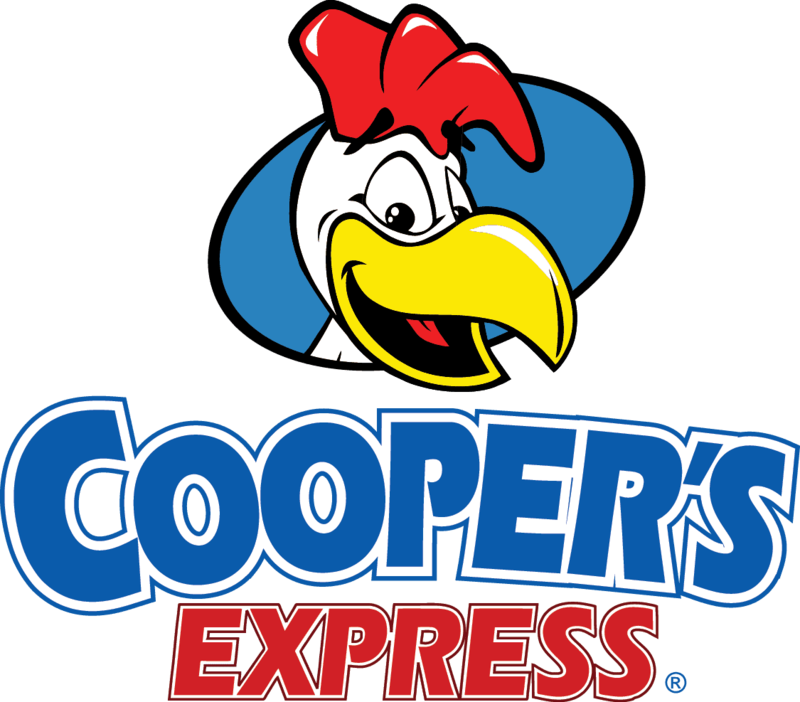 Want more information about Cooper's Express? Contact us to get the revenue boosting information you need! Because PFSbrands is committed to helping you grow and to be successful, the company provides new retailers with on-going Marketing Development Funds (MDF) that are designed to finance all or part of your advertising and/or promotional efforts. Compare this to other well-known brands in our industry who typically charge anywhere from 2% to 5% of their retailers’ gross sales for advertising. We completely reverse this strategy with our MDF program. To fund your advertising and promotional activities, we will bank 1.5% of your Cooper’s Express purchases of our branded product and packaging from your local foodservice distributor. Keep in mind, PFSbrands also charges NO INITIAL FRANCHISE FEES and NO ONGOING ROYALTIES of any kind. So, this is a very retailer-friendly program! You may notice a significant difference in retail price points between Cooper’s Express vs. Champs Chicken value meals. The snacks and meals on the Cooper’s menu do, in fact, have lower price points. The difference in those price points is all about the sides that come with the value meals. For example, the suggested retail price point for a Champs Chicken 2-piece chicken tender meal is $6.59 and the Cooper’s Express 2-piece chicken finger meal is $5.19. If you take a closer look at the menus, you will notice the Champs Chicken meal includes 2 sides and a biscuit, while the Cooper’s Express meal has 1 side and a biscuit. Many retailers located in especially price sensitive markets greatly appreciate Cooper’s Express menu structure and lower price points as it allows them to be more competitive without diminishing their profit margins. The following branded signage package is required for the inside of every branded Cooper’s Express retailer. Cooper’s Express brings big, bold flavors and the tastiest, most comforting foods your customers are craving. The quality of the Cooper’s food you serve matches the exceptional quality of our flagship brand—Champs Chicken. The Cooper’s breading profile adds a little more of a kick with its Cajun spices compared to the Country Breading from Champs Chicken. The best-selling item on Cooper’s menu is their famous Cooper’s Chicken Skewers which are dunked in an irresistible, spicy Mandarin Orange sauce or Southern Heat BBQ sauce… or served plain. 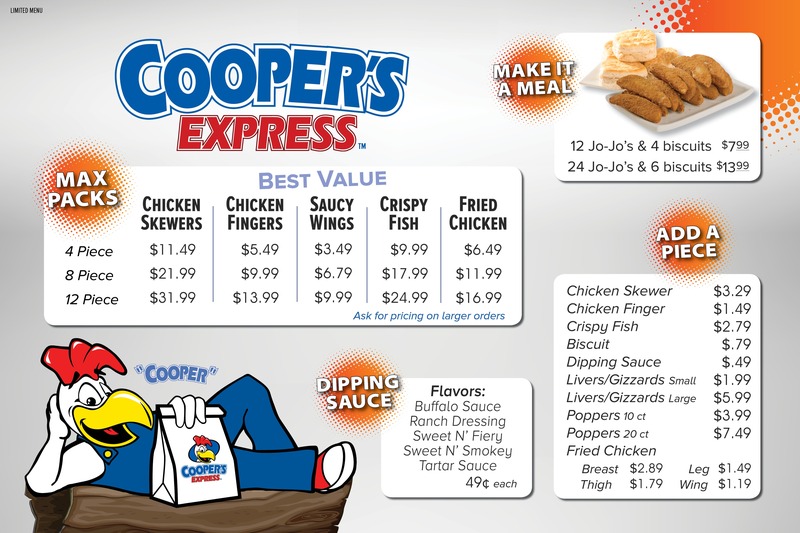 Cooper’s Express offers a choice of 2 menu selections– full or limited. Both menus will meet the forthcoming FDA mandate for caloric menu labeling. The difference between those two menus relates directly to number of sides the reseller markets. The FULL menu includes Jo-Jo potato wedges (a product you fry) and a wide range of heat and serve sides that are packed in sealed pouches. The LIMITED menu includes Jo-Jo potato wedges, but NO heat and serves sides. As such, the limited menu is an ideal menu solution for smaller-sized retail stores with limited space… or… smaller volume stores that want to restrict the number of items they need to inventory. CHICKEN FINGERS: Double-coated and irresistible. CHICKEN SKEWERS: Battered, breaded and fried on a 10” stick. Dunked in sauce — Spicy Mandarin Orange or Southern Heat (BBQ). CRISPY FISH: Crispy outside, perfectly moist and flaky inside..
JO-JO’S: Classic wedges of seasoned fried spuds. LIVERS & GIZZARDS: Breaded and deep-fried to a golden brown. GREEN BEANS: Good ol’ Southern-style beans with tasty bits of country ham bits. SAUCY WINGS: Turns any meal or game-watching event into a big hit. MASHED POTATOES: The humble creamy potato topped in gravy is king. SWEET CORN: Rich, creamy and perfectly hearty. FRIED CHICKEN: Crispy and juicy. The be-all, end-all Southern classic.